It’s hard to believe that just a couple of short months ago, the Dallas Stars sat solidly atop the hotly contested Pacific Division and the San Jose Sharks were barely clinging to the final playoff spot heading into the All-Star break. Through 50 games, the Sharks posted a 25-19-6 record (56 points) which left them tied with the Chicago Blackhawks and Colorado Avalanche for 7th place in the Western Conference. Fast forward to the end of the regular season. The Sharks completed their 23-6-3 romp through the post All-Star schedule with a 3-1 victory at home against the Phoenix Coyotes on Saturday night. Calder Trophy (Rookie of the year) candidate Logan Couture notched his 32nd goal of the season and Joe Pavelski came through with his 20th, securing San Jose’s 2nd seed in the playoffs with 105 points. Netminder Antti Niemi logged 35 saves in the regular season finale. 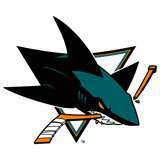 Niemi, who began the season with a 13-13-3 record in the crease, came up huge for the Sharks when it counted most, going 22-5-3 in the home stretch, posting a 2.37 GAA for the season with a .920 overall save percentage. In a reversal of fortunes, the Stars completed their fall from playoff grace with a 5-3 defeat to the Minnesota Wild on Sunday, enabling the Blackhawks – who earlier in the day had failed to ensure an opportunity to defend the Stanley Cup in a 4-3 loss to the Detroit Red Wings – to slide into the eighth slot and a first round date with the President’s Trophy-winning Vancouver Canucks. The Stars’ defeat put the finishing touches on a breathtaking Pacific marathon which almost culminated in the entire division advancing to the post-season. With Sunday’s contests in the books, we can now officially look at the first round of the playoffs and debate the chances of the underdogs overcoming the top seeds. Though the 2011 President’s Trophy winners split their season series with the 2010 Stanley Cup Champions at two apiece, it would be easy to predict a Vancouver victory over Chicago in a best-of-seven series. Not so fast. Without taking away from the Canucks’ dominating year, it is fair to point out the benefits of playing in the Northwest Division. Vancouver beefed up its heavyweight statistics cruising to an 18-4-2 record against the flyweight Calgary Flames, Minnesota Wild, Colorado Avalanche, and Edmonton Oilers, all of which are already en route to the lakes of their choice. The Northwest is the only NHL division sending a lone representative to the post-season. Though the Blackhawks stumbled into the playoffs like a car sputtering its way into a remote gas station barely surviving on fumes, Chicago played arguably a tougher schedule to get there, and have to be taken seriously as an upset threat to send the Canucks packing in the first round, just like three of the past five President’s Trophy winners. Pre-season analysts picked the Sharks and Kings as the likely candidates to win the Pacific Division. San Jose proved with exclamation points why some of them were right. Though the two squads split their six regular season games, that’s as close as things are going to get. The Sharks have been firing on all cylinders for the past couple of months and Coach Todd McLellan may finally have the right pieces in place to win sixteen games and bring Lord Stanley’s Cup to San Jose. Los Angeles began the season with similar expectations, but it would take a miracle of biblical proportions to overcome the loss of All-Star Center Anze Kopitar to a season-ending ankle injury. The playoffs will begin with all three California teams making an appearance for the first time ever. That’s one more than will be representing all of Canada, as Helene Elliott of the Los Angeles Times pointed out the other day. No more than two teams from the Golden State will remain, however, after the first round. When asked last week what kind of playoff advice he might have for his teammates after his experience winning the Cup in Chicago last year, goaltender Antti Niemi responded, “I think there’s no secrets. You just gotta stay focused and try to not think too much.” Whatever Niemi and the Sharks have been doing over the past 32 games, it’s working. Prediction: San Jose in 5. Is anyone surprised that the Red Wings won their division? Didn’t think so. When asked about the swagger that Detroit brings to every arena in the league, Sharks Coach Todd McLellan remarked matter-of-factly that they’ve earned it with their success in winning the Cup, and until his team and others lacking the Red Wings’ hardware do the same, they simply won’t be feared around the league as are the boys from Hockeytown. Team captain, All-Star, and Norris trophy candidate Nicklas Lidstrom put up 16 goals and 46 assists to finish second only to Henrik Zetterberg in scoring for the squad. Not bad for someone turning 41 at the end of April. Phoenix has done a tremendous job remaining competitive despite the utter chaos surrounding franchise ownership and the future of the club. Throughout the season the Coyotes flirted with the Pacific Division lead before settling for 3rd place on the final day. The two teams split their four contests this year, and the playoff series will likely come to a showdown between the explosive Detroit offense and the superlative goaltending of Ilya Bryzgalov. Entering Friday night’s first game of a home-and-home series with the crosstown rival Kings, the Ducks didn’t even know if they would still be standing for the first round of the playoffs. At Honda Center, fans agonized at the prospect of Teemu Selanne possibly playing his final career game at home. The ageless Finnish Flash put those fears to rest, netting both of Anaheim’s goals in a 2-1 victory over L.A., setting up the back-end rematch at Staples Center where a 3-1 win launched the Ducks into 4th place with home ice advantage in the first round. The Nashville Predators edged the Ducks three games to one during the regular season thanks in large part to the phenomenal goaltending of Pekka Rinne, the only loss being attributed to back-up netminder Anders Lindback. Rocket Richard Trophy-winner Corey Perry, the NHL’s only 50-goal scorer and a leading contender for the Hart Trophy, will attempt to turn the tables in the post-season. With 18 goals, 50 assists, and leading all NHL defensemen with 68 points, Norris Trophy candidate Lubomir Visnovsky has been a revelation after the loss of future first-ballot Hall of Famer Scott Niedermayer to retirement in the offseason. But goaltending will be a huge question mark for the Ducks as Coach Randy Carlyle must roll the dice between All-Star Jonas Hiller, who has barely played in two months while suffering from vertigo-like symptoms, Ray Emery, who has not returned to the line-up since removing himself from a game last week with a “lower-body injury,” and third option Dan Ellis, who won both games against the Kings on the final weekend and has played capably since his late-season acquisition from the Tampa Bay Lightning. The Rangers are another team which waited until the last possible moment to punch its ticket to the post-season, whereas the Capitals all but locked up their playoff entry weeks ago. Nonetheless, New York has had Washington’s number this year, keeping Alex Ovechkin in check while winning three of four. The Rangers actually outscored the Capitals this year, 233-224, while surrendering only one more goal over the course of the season. Of all the first round match-ups, this one has the greatest potential for an upset. Prediction: New York in 6. In a tale of two teams heading in completely opposite directions, the 2010 Eastern Conference Champion Flyers couldn’t be falling apart at a worse possible time, winning just 3 of their last 11 contests. The surging Sabres, by contrast, have won 8 of their last 10. Philadelphia continues to sport the more compelling offensive firepower between the clubs, but last year’s Vezina Trophy winner, Ryan Miller, could nullify the Flyers’ sharpshooters if he returns to form. Defenseman Chris Pronger stands to be the key difference maker in this series if he returns 100% from surgery and shuts down the Sabres’ forwards. Montreal dominated the season series between these Northeast Division rivals, winning four of six. But the Bruins gave the Canadiens a lot to think about with a 7-0 spanking on March 24 in the final regular season match-up between the squads. Boston’s Vezina Trophy favorite and All-Star goaltender, Tim Thomas, leads the NHL with a sick 2.00 GAA and .938 save percentage. The Bruins’ 6’ 9” Slovakian defenseman, Zdeno Chara, four-time winner of the NHL’s hardest shooter contest with a record 105.9 mph missile last January, finished on top of the plus-minus charts with a plus-33 for the season. Look for the first round to yield a completely different result between these two teams than was exhibited during the regular season. We can stop the voting now and bestow this year’s Jack Adams Award to Penguins’ Coach Dan Bylsma by acclamation. With Sidney Crosby and Evgeni Malkin out of commission for half the season, Pittsburgh simply shrugged it off and put together an incredible 106 point campaign. Crosby had racked up an astonishing 32 goals and 34 assists in 41 games when a concussion knocked him out of the regular season. Double those numbers and he’s got the Richard, Ross, and Hart Trophies nailed down. Goaltender Marc-Andre Fleury did his part to keep opponents off the scoreboard while defenseman Kris Letang and forwards Chris Kunitz, Tyler Kennedy, and James Neal (a mid-season acquisition from the Dallas Stars) stepped up to light the lamp for the Pens. The Lightning put together an impressive season of their own. Martin St. Louis and Steven Stamkos literally lit up the league with 99 and 91 points respectively. Head-to-head, the teams split their four games evenly. Today Only – Free Shipping On Apparel Orders Over $75 at Shop.NHL.com!